Pioneer Girl , by Maryanne Caswell is one of those quick, cozy fall time reads. 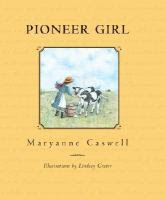 Published by Tundra Books, this is an 82 page story told through the letters which young Maryanne Caswell wrote to her grandmother as her family traveled across the prairie. It is an insider's look, if you will, at life on the Canadian prairie. Oh yes, my friends, it's also quite a fun and different book because it tells of pioneer life in the Canadian frontier! I absolutely loved this "simple" little book and heartily recommend it for a quick read or a delightful read aloud. Certainly even young children can get caught up in the excitement of traveling west, surrounded by unknowns! 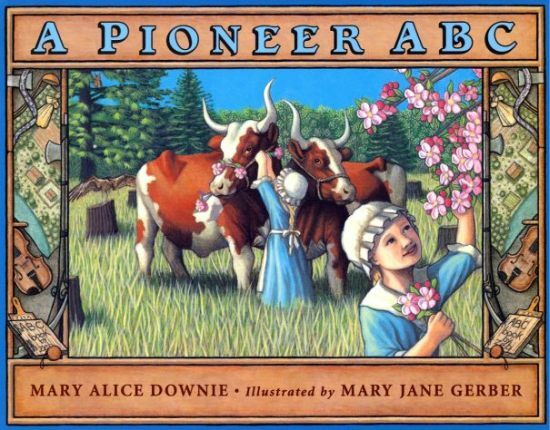 Along the same theme, you might also want to check out A Pioneer ABC , by Mary Alice Downie. This particular title is not strictly related to Canada but can be used when talking about pioneering in general. This alphabetic picture book takes you around a family farm. We meet siblings, learn about dyes that color clothes, kettles used to cook, log cabins, oxen, quilts and many other things. This book is a beautiful and fun way to learn how life was "way back when" to get a feel for the hardships people endured as they made new homes for themselves in unfamiliar places. I so enjoy books like this and particularly enjoyed the beautiful illustrations in this one by Mary Jane Gerber. A Pioneer ABC is also available in paperback if you'd prefer it in that format. The cover art is different between the hardback and paperback editions, but the illustrations are all by Gerber, regardless. If you enjoy discussing the life of the pioneers, I'd heartily recommend adding these particular books to your reading list. My thanks goes to Tundra Books who provided copies for me to read through. Wonderful resources, both! Thanks, Tundra! Pioneer Girl sounds great. Though I never could have made it as one---not tough enough!---I love to read about pioneers. Lately, I have been collecting a lot of books about them. Maybe I'll add this one to my list! Hmmm. . .these sound like they might make good Christmas gifts for my pioneer-loving girls! Does sound like a good read. I'm all for cozy, enjoyable books!